Guy Raffa, casting a glance further back in the UT Austin history blog Not Even Past, considers Henry Wadsworth Longfellow’s appreciation of Abraham Lincoln in the light of his contemporaneous work of translating Dante’s Commedia into English. The Dante-Longfellow connection has also been the subject of a recent special issue of Dante Studies (2010), edited by Giuseppe Mazzotta and Arielle Saiber. Raffa draws important attention to issues of social justice and freedom that animate Longfellow’s appreciation of Lincoln and Dante, alluding also to Dennis Looney’s book Freedom Readers (University of Notre Dame Press, 2011) on the reception of Dante in African-American culture. In the same vein, Teodolinda Barolini extends consideration of JFK’s focus on neutrality as an abhorrent form of moral cowardice to Martin Luther King, Jr.’s use of the same line in his 1967 speech explaining his opposition to the Vietnam War. As both Parker and Barolini make clear, the line cited by JFK and MLK does not technically come from Dante nor does it correctly state the precise details of Dante’s heterodoxical treatment of the neutral souls of Inferno 3: far worse than the ‘hottest places of hell,’ those who refused to take a stand in life are excluded from heaven and hell altogether. Parker traces Kennedy’s engagement with Dante back to Franklin Roosevelt’s acceptance speech at the Democratic convention of 1936, where he said: “Governments can err, Presidents do make mistakes, but the immortal Dante tells us that divine justice weighs the sins of the cold-blooded and the sins of the warm-hearted in different scales.” For Parker, this distinction is between upper and lower hell, between the heat of incontinence and the coldness of treachery. While the distinction holds and is certainly in line with a structural reading of Inferno, we might also consider it an extension of focus on the neutrals, on indifference and inaction as considered by a relative of FDR: Theodore Roosevelt. Thomas Bailey and Katherine Joslin have recently argued in their book Theodore Roosevelt: A Literary Life (ForeEdge, 2018) that there is much to be gained in examining Roosevelt through the lens of his prolific writing and voracious reading throughout his life. By focusing our attention on Dante in particular, we can uncover a long-standing relationship that finds voice in particular aspects of Roosevelt’s political convictions and intellectual life. It is not the critic who counts; not the man who points out how the strong man stumbles, or where the doer of deeds could have done them better. The credit belongs to the man who is actually in the arena, whose face is marred by dust and sweat and blood; who strives valiantly; who errs, and comes short again and again, because there is no effort without error and shortcoming; but who does actually strive to do the deeds, who knows the great enthusiasms, the great devotions; who spends himself in a worthy cause; who at the best knows in the end the triumph of high achievement, and who at the worst, if he fails, at least fails while daring greatly, so that his place shall never be with those cold and timid souls who know neither victory nor defeat. Roosevelt does not explicitly cite Dante, but his focus on cold and timid souls who do not dare to act seems clearly derived from the characterization of the neutrals in Inferno 3. 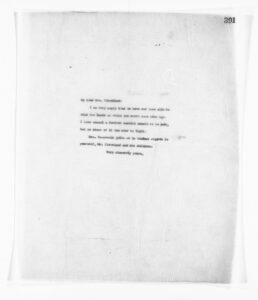 In fact, his engagement with Dante stretches back further and in more explicit fashion, as we can gather from the documentary evidence of the Theodore Roosevelt Center’s Digital Library. 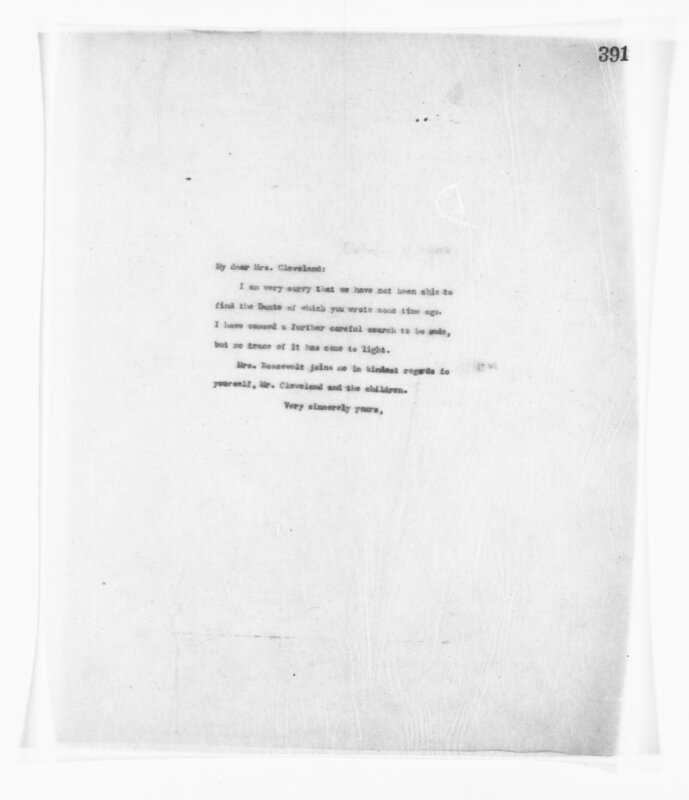 Also in the early period of his presidency (July 1902), there is a problem in returning a copy of Dante to the former First Lady Frances Folsom Cleveland. 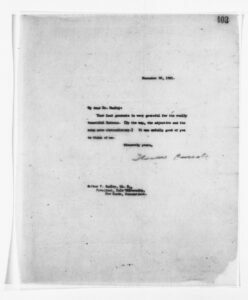 Roosevelt himself writes a note to Cleveland apologizing for having sent the wrong book to her. 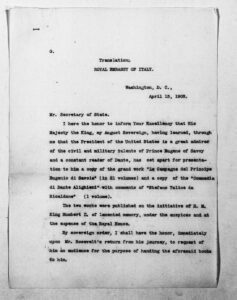 Though further searches are made, Roosevelt eventually writes with regret that they have been unable to find the right book. What seems to be clear is that there is at least one copy of the Commedia in the White House, even if it is not the one that was left behind by the Clevelands. If you are reading Dante, don’t stop at the Inferno. It is wonderful and of course much the best known but there is as much lovely poetry in the Purgatorio and the wonderful lift which comes from going up rather than down, and then nothing of the mere details of pain and dirt. It is my favorite of the three tho’ I don’t like to use the word favorite about anything which has meant so much to me as Dante. The Purgatorio also lacks the endless metaphysics of the Paradiso. Carlyle only did the Inferno but your friend and admirer, Charles Eliot Norton, has made a very fair prose translation of the Divine Comedy, and that is all one wants. La Farge’s remarks provide a fascinating window into early 20th-century reading practices and her own passion for Dante, but she is perhaps mistaken that Roosevelt has not read Dante before. 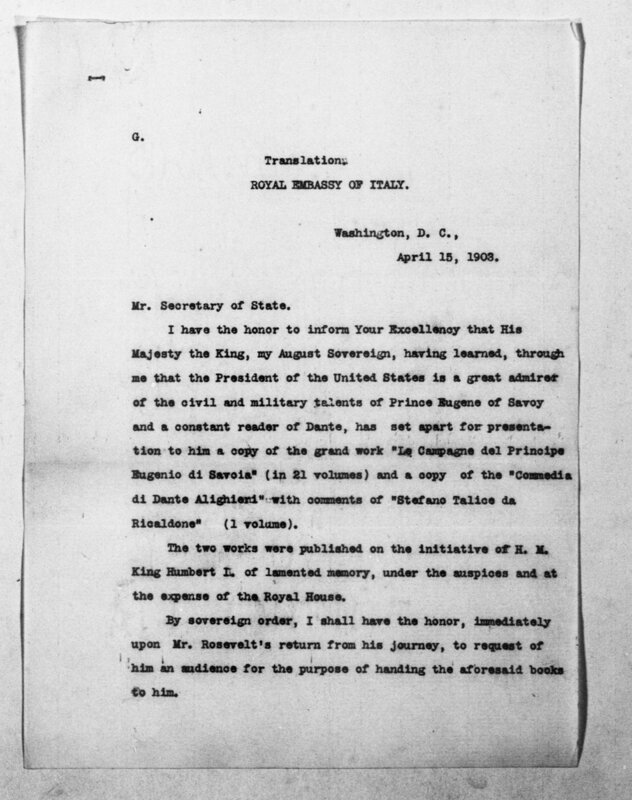 A year earlier, the Italian ambassador to the US, Edmondo Mayor Des Planches, writes to request an audience with Roosevelt to present him with a gift from the king. The gift consists of two books, Dante’s Commedia and a 21-volume work on the 17th and 18th-century military campaigns of Eugenio di Savoia. 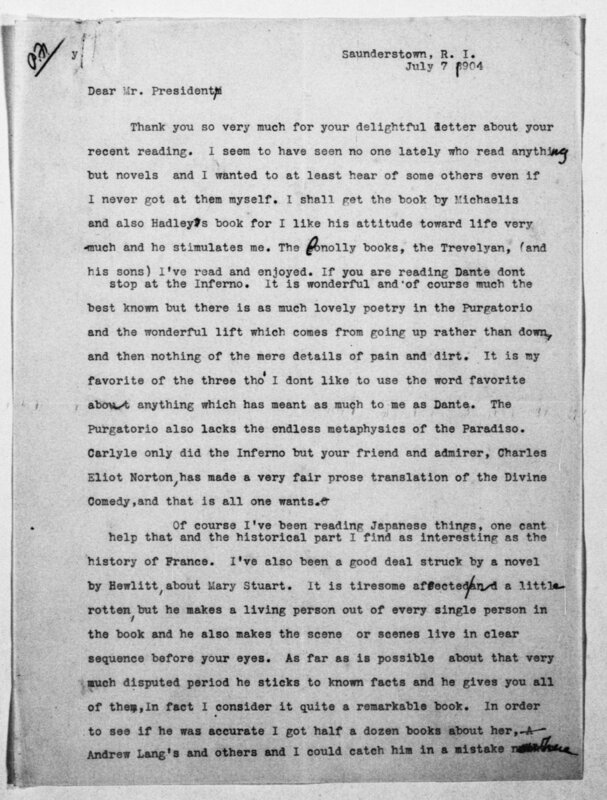 Des Planches makes clear in his letter that the king has heard from him that Roosevelt is “a constant reader of Dante,” and so makes the appropriately sumptuous gift of a Commedia that was lavishly printed under the auspices of the former king Umberto. It seems that Roosevelt himself found these pieces to be connected, since he gathered them in an edited volume called History as Literature and Other Essays. The volume, published in 1913, included the titular essay, some other pieces Roosevelt published in Outlook, one from The Century, and the text of four post-presidential speeches. Roosevelt explains that the texts he gathered in the volume promote his view of the interconnectedness of history, science, and literature: “In these addresses and essays I have discussed not merely literary but also historical and scientific subjects, for my thesis is that the domain of literature must be ever more widely extended over the domains of history and science.” In laying out such a claim, Roosevelt shows exactly why he is such an apt reader of Dante. Of all the poets of the nineteenth century, Walt Whitman was the only one who dared use the Bowery—that is, use anything that was striking and vividly typical of the humanity around him—as Dante used the ordinary humanity of his day; and even Whitman was not quite natural in doing so, for he always felt he was defying the conventions and prejudices of his neighbors, and his self-consciousness made him a little defiant (220). Roosevelt dwells at length on Dante’s cultural syncretism, his unabashed mixing of the names of antiquity with the stormy present of Florentine politics. He isolates particular cases that demonstrate a deep reading, such as his remarks on Farinata and Capaneus as “the great souls—magnanimous Dante calls them—whom no torture, no disaster, no failure of the most absolute kind could force to yield or to bow before the dread powers that had mastered them” (223). Roosevelt (seemingly unaware that Capaneus is a classical figure) is both struck by Farinata’s natural juxtaposition to figures like Alexander and Caesar as well as what he characterizes as Dante’s “shuddering admiration” for the defiance that these figures exhibit. In this, we can not only see a connection to his ‘man in the arena’ but also perhaps a window into his Dante reading that resonated with his fifth cousin Franklin Delano in terms of warm-hearted error being judged differently from cold indifference. 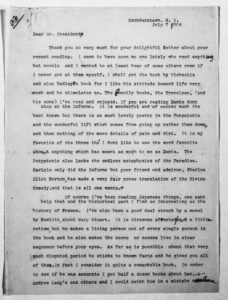 While mostly focused on Inferno, Roosevelt does range at least to Purgatorio as well, and we must wonder whether this reflects his reading a bit more and further at the urging of Florence La Farge. Toward the end of the essay, we find a particularly telling passage that reflects Roosevelt’s admiration for Dante’s ability to penetrate “through the externals and into the essentials” and his own ability to connect such a method to his present: “Cato and Manfred illustrate his point no better than Belacqua, a contemporary Florentine maker of citherns. Alas! what poet to-day would dare to illustrate his argument by introducing Steinway in company with Cato and Manfred!” (228). For Roosevelt, such poetic mixing is vital to produce insight into the present and while he does not urge the creation of a modern epic by way of mimicking Dante’s art, he sees a pressing need to recognize, as Dante did, “the eternal qualities which we admire or condemn” in every moment of human history and especially in our own (229). Henry Cabot Lodge, after filling Roosevelt in on his qualms about Taft’s stance on an international arbitration treaty being negotiated, expressed admiration for Roosevelt’s Dante essay and thanks to him for having sent along the issue of Outlook in which it appeared. 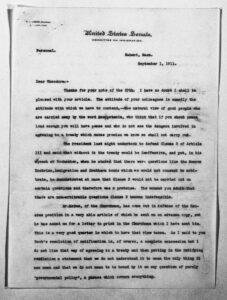 Lodge’s letter presents a telling mix of political sympathies and an aesthetic appreciation of Roosevelt’s intellectual work. It is worth noting that Roosevelt was growing increasingly dissatisfied with his chosen successor Taft’s presidential performance on matters both foreign and domestic. He expressed this discontent quite often in the pages of Outlook magazine, for which he served as an associate editor. In this context, we might consider the man in the arena and Roosevelt’s Dante essay as both representing an extreme aversion to the coldness of neutrality. Not content to be a critic as Taft increasingly turned toward the conservative flanks of the Republican party and certainly unwilling to be relegated to the role of “colui / che fece per viltade il gran rifiuto” [he / who made, through cowardice, the great refusal] (Inferno 3.59-60, Mandelbaum translation), Roosevelt founded the Progressive Party and ensured that Taft would be unable to win reelection in 1912 by mounting what remains the most successful third-party candidacy in American political history. All images used with permission of the Theodore Roosevelt Center at Dickinson University.